Now this is the way bottled tea was meant to taste. If you ask me, that is. Not that you did. But I'll inflict my opinion on you anyway. Toss those sickly sweet tea-like beverages in the bin and give Anteadote a whirl. 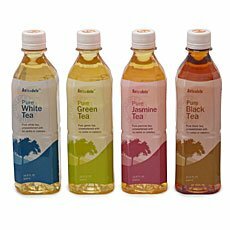 Adagio Teas makes four different flavors of Anteadote bottle tea, including black - which I reviewed here - jasmine, green and white. Each contains nothing more than purified water, tea and vitamin C, which works for me just fine. What else do you need? What surprised me the most about Anteadote White was just how strong the flavor was. I admit to not having a real wide experience with white tea, but those that I have sampled - both hot and bottled - have always been very subtle. Anteadote White has quite a bite, kind of a like a robust green without quite so much of the greenish flavor, if that makes even the least bit of sense. Highly recommended. Down with sugar.